About six years ago I rediscovered the mall. I had not shopped in a mall since high school. Once I was married with kids there really didn't seem to be any need for "mall worthy" clothing, especially with four targets only ten minutes away from my house in every direction. But one day it happened. I entered the mall and wandered into a colorful and festive store called "Forever 21". It was love at first sight. Not only was the store massive, it also had the largest variety of merchandise I had ever seen in one store. Beautiful clothes in all shapes and styles lined the racks, sometimes laid out by color schemes or season. I remember thinking I had found Mecca. As soon as I started looking at the prices I thought it had to be a joke. There was no conceivable way that I should be able to buy such lovely, decadent things for less than $20. SCORE! On that first visit I was looking for clothes to wear on stage when I performed with my new band. I had not bought anything "stage worthy" since just after college. I was excited, feeling like a young girl rather than a barfed-on Mom. I had also just lost sixty pounds. Talk about a perfect storm. I took my time. I slowly walked through the entire store, pulling out this and that for closer examination. I touched the soft fabrics and held them up against me in the mirror. Eventually I tried a few things on and draped the ones I loved most over my arm. Next I found the jewelry section, filled with colorful baubles and glittery gems. I put a few on my ever growing pile of treasures. After about three hours I finally stood in the exceedingly long line of shoppers to make my purchases. That was when I noticed that everyone else in line was a teenaged girl. Here I was, a thirty-something mother of two, pretending to be "Forever 21" and loving every minute of it. The fact that I fit into the same clothes as the other girls in line made me feel like a goddess. I sometimes think of that first trip to Forever 21 as the day I got my youth back. Just as the name says, I was frozen forever, a 21 year old hottie, destined to be a rock star.....and all for under $60. 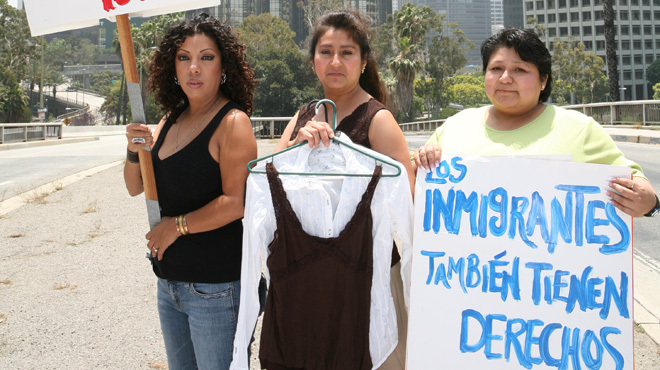 In the 2007 documentary "Made in L.A.", three Latina immigrants attempt to wage a battle against Forever 21 in order to gain better working conditions and higher salaries. Keep in mind, this story takes place in Los Angeles. Yes folks, it happens here too. The film documents their three year struggle and highlights its impact on their lives as they are transformed by their journey. In one scene the women take a trip to the mall and stand in front of Forever 21 looking at the outfits in the windows. One of them says, "my sister did the neck for 8 cents and I stitched the bottom for 11 cents." "We sent a letter to the president of Forever 21, telling him we sewed his garments but we weren't even paid minimum wage. We asked him to take responsibility. But he said he didn't know us, that we had never worked directly for him." "Regarding that problem, those are actually not my employees. Those are people who work at a company that sells products to us. With companies that we just buy and trade with, we try to check up on their working conditions and try to prevent any problems. That incident happened almost 10 years ago. And, even though it was not our fault, we have tried to fix it. And now we don't have any problems." Just after that interview was published in 2012 yet another law suite was filed against them by workers for the same reasons documented in the film. Pretty eh? I love these items and have worn them over and over again in the last several years. As I was building my burn pile a few weeks ago, I practically wept when I realized that all these items would have to go. I also felt sick to my stomach when I realized that I never questioned the true reason they cost me so little. Nothing costs so little. Somebody, somewhere, paid the ultimate price to get these garments onto my body. Suddenly in a flash, I could see past the beautiful fabrics and feminine lines of my precious garments and into the eyes of the young girl who made them. 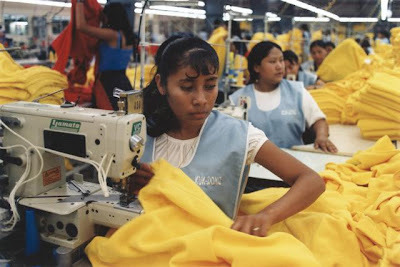 It was as if I could hear the blaring noise of the sewing room, feel the vibration under my feet, the sweat on my brow, the ache between my shoulder blades. Somebody made these beautiful things for me, somebody that I will never meet...a young girl with hopes and dreams, someone not even 21, someone who will never be 21.